Transitional styled, the 5-Light Brushed Nickel Chandelier with White Fabric Shades from Hampton Bay will elegantly complement a range of decor from traditional to contemporary. Featuring a sleek brushed nickel finish and white fabric shades, this chandelier is perfect for an eat-in kitchen, kitchen island or foyer. Easy to install, coordinate with other brushed nickel pieces from Hampton Bay for a polished look and lasting enjoyment. 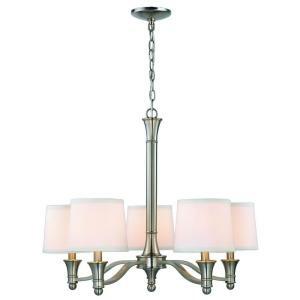 Home territory searches the web to find the best prices and availability on Chandeliers and related products foir your home like Hampton Bay 5-Light Brushed Nickel Chandelier with White Fabric Shades. For this page, related items include products we find that match the following keywords: "Chandelier" at our vendor partner Home Depot. Hampton Bay 5-Light Brushed Nickel Chandelier with White Fabric Shades is one of 84 Chandeliers and related products available for sale through HomeTerritory.com, If you have any questions on this product, please give us a call at 734-971-1210 during the hours of 9am - 5pm EST for assistance. Thank you for shopping at Home Territory, the home furnishings superstore!